Don't let the bad internet disturb your enjoyment!! 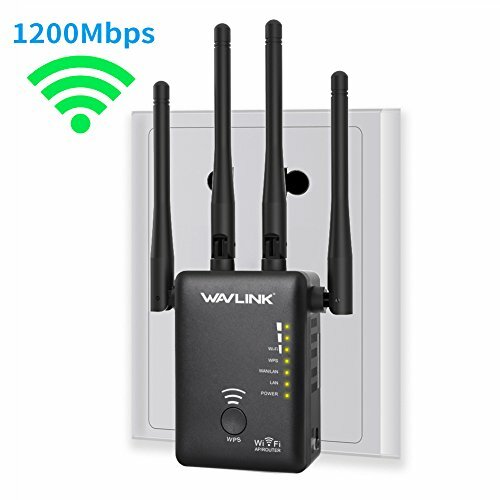 WAVLINK AC1200 Dual Band WiFi Range Extender can Improve and Extend your Existing WiFi, let you enjoy your technology life everywhere, why not give it a try? The Repeater comes with 60 days money back guarantee and 24 months warranty, why not give it a try? Boost Your WiFi Coverage --- AC Technology and 4 External Antennas eliminates dead spots in your home and outdoors, brings you the high-speed WiFi. Easy Installation & Relocation --- Clearly Online video and Manual to guide you set up it easily. Compact Design let you relocate it easily. 3 IN 1 Mode --- Repeater, Access Point, Router to meet all your requirement. Media Bridge --- While boosting your existing Wi-Fi coverage, the two Ethernet ports can also connect any wired device. Port: 1×WAN/LAN Port + 1×LAN Port. 【1200Mbps High Transmission Rate】: The Dual band can deliver the reliable wireless network up to 1200Mbps, you can enjoy HD video, game or transfer large digital files everywhere. 【3-IN-1】: Repeater, Access Point, Router to meet all your requirement. Includes two Ethernet ports, to connect any wired Ethernet device while boosting your existing Wi-Fi coverage. 【Boost WIFI Coverage】: 4 External Antennas for the best performance, boosts your existing Wi-Fi coverage, extend wireless network to dead spots. 【Compatible with Wireless N and AC】: This wireless network extender can be used with any 802.11b/g/n/a/ac wireless Internet router, allowing you to easily extend the range of your home Wi-Fi network and keep all your mobile devices connected without having to purchase more equipment.